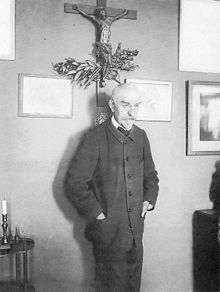 Charles-Marie-Georges Huysmans was a French novelist who published his works as Joris-Karl Huysmans. He is most famous for the novel � rebours (Against the Grain or Against Nature). His work is remarkable for its idiosyncratic use of the French language, extensive vocabulary, detailed and sensuous descriptions, and biting, satirical wit. It also displays an encyclopaedic erudition, ranging from the catalogue of decadent Latin authors in � rebours to the discussion of the iconography of Christian architecture in La cath�drale. Huysmans expresses a disgust with modern life and a deep pessimism, which led him first to the philosophy of Arthur Schopenhauer, then back to the Catholicism in which he had been raised. The only really indecent people are the chaste.